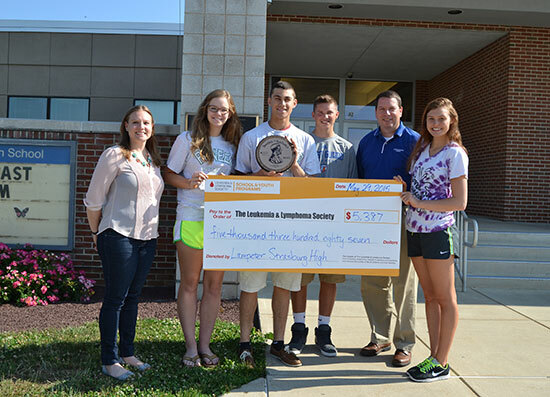 Led by the Interact Club, Lampeter-Strasburg High School students collected $5,387 in change in just one week for the Leukemia & Lymphoma Society (LLS). The club held the Pennies for Patients fundraising drive in March and solicited donations through a variety of activities. Mr. Spencer and Interact officers with a commemorative plaque. Several teachers pitched in by shaving their heads and/or holding classroom competitions. Interact advisor Mr. Cooper also held popular cafeteria competitions in which the winning table was treated to lunch outside of school. The result was a donation that made L-S one of the top-giving schools in our whole region, contributing more than five times the average amount! 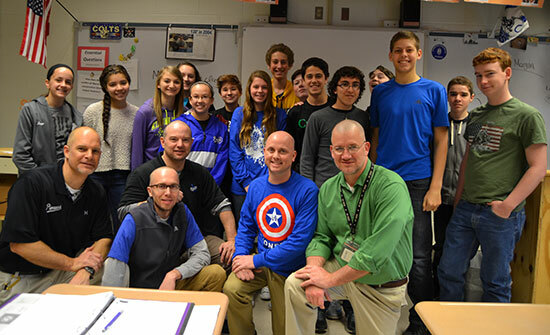 A LLS campaign manager visited on May 29 to present a special plaque and thank students for their efforts. Many thanks to Interact and to all who participated! The campaign in action in March. More than 14.4million students and 10 million educators in almost 29,000 schools across the country are participating in The Leukemia & Lymphoma Society's (LLS) School & Youth Programs, Pennies for Patients, Olive Garden's Pasta for Pennies, and High School Program. For the past 17 years students have shown how much of an impact they can have by raising more than $261 million to fund breakthrough therapies and patient services; and more than $28 million in 2013-2014 alone! ?